Are you looking for more stories on what makes Memphis great? Be sure to follow our Instagram page below! Memphis is a city you truly need to see to believe. While the best way to do this is to actually visit our great city, we want to highlight some of what you can expect on such a visit. That is why we wanted to showcase some amazing photos that will make you want to visit Memphis as soon as possible. Memphis is a beautiful city at all times of day. But here is a picture of the city at dawn, while many of the residents are still asleep, and the city itself is just waking up. It highlights the fact that Memphis isn’t just a large city. There’s plenty of park space surrounding the city. It also has beautiful architecture and a great riverwalk. There truly is something for everyone here in Memphis. Downtown Memphis isn’t all tall skyscrapers and massive buildings. As you can see from the photograph, it has a very down-to-earth feel, from its cobblestone drive to the locally owned restaurants, bars, music joints, and clothing shops. This is what America used to look like just a few decades ago, but many cities abandoned this look in favor of what was new and shiny. 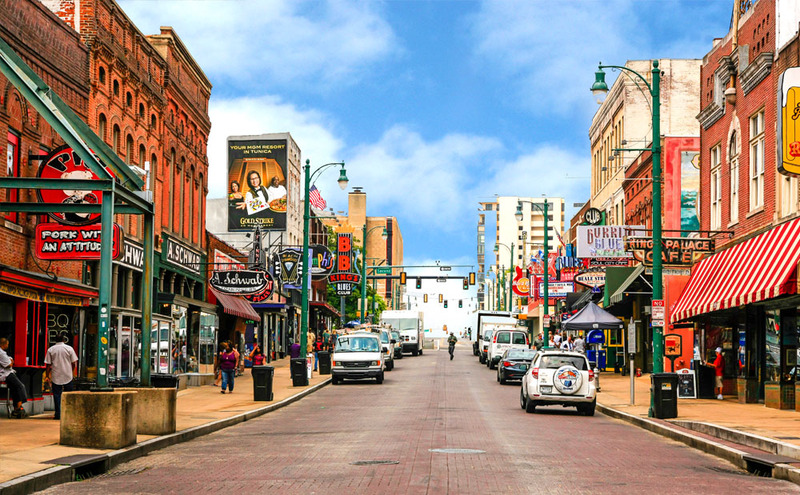 In Memphis, you’ll experience an incredible blast from the past while at the same time taking in what truly helps make the city incredible. Memphis is full of quirks. It’s unique in just about every way. There’s a reason this area of the city was voted as one of the best streets to walk in the whole country. The vibrant signs are all different and each represents a locally owned business. You’re not going to find a Tater Red’s anywhere else. Nor are you going to take in the same experience anywhere else as you do at BB King’s Blues Club. This blues guitar legend opened up the club and—while the man himself may no longer be around—his music lives on forever. So whether you’re interested in just walking the street or you want to stop in for world-class culture, you’ll never find anything else like what you’ll discover in Memphis. The city of Memphis is an incredible destination. Whether visiting for pleasure or moving to the city for good, you’ll always find something new and exciting to take in. While the best way to experience the city is to visit it first hand, these were only some of the many amazing photographs that highlight just how special a place Memphis is.